Two Rotherham town centre sites that were once key to the council's riverside regeneration aspirations, are set to be sold off. The former NatWest bank branch on Corporation Street has hit the market and the council is close to concluding a deal to dispose of Westgate Chambers. Part of the taxpayer-owned Royal Bank of Scotland Group plc, the NatWest branch closed in September 2014 and now the stone building in an Edwardian Classical style is up for sale with agents, DTZ. The freehold of the 8,490 sq ft, three floor property has been given a guide price of £225,000. 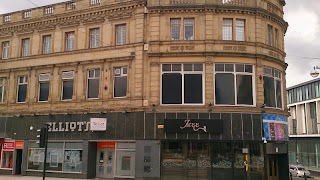 In 2008, with the Rotherham Renaissance regeneration programme in full swing, negotiations were concluded and NatWest had recommended to its board that the Corporation Street building should be sold to Rotherham Council. It would have been added to its portfolio of strategic acquisitions in the area, that also includes the adjacent Lloyd's bank. 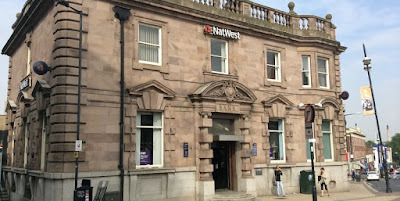 By 2009, and the onset of the banking crisis, NatWest reneged on a proposed move into the commercial unit in the Old Market building and the council's acquisition was off. Last year, the cabinet at Rotherham Council agreed plans to put Westgate Chambers onto the market to "seek developer interest for a predominantly residential development." It was advertised as a regeneration / development opportunity with "offers sought for a residential led scheme with an active commercial ground floor of retail / leisure / restaurant or similar." Commissioner Julie Kenny has now made the "minded to" decision to allow the council to negotiate and conclude the sale of Westgate Chambers to an unnamed proposed purchaser. Acquired in 2006, the reduction in available funding meant that initial plans for the refurbishment of Westgate Chambers, stalled. The plans had aimed to deliver around 60 high-quality apartments with commercial units underneath. An application to the National Heritage Memorial Fund by the council for a £1.9m project based on the Grade 2 listed buildings that made up John Platt's house on the site, was rejected. Last month, Commissioner Kenny was minded to defer consideration of a report on Forge Island, another key regeneration site. The council owned site at Doncaster Gate, where the authority demolished the Victorian hospital, is set to be sold off in the 2015/16 financial year. Across town, commercial property agents, Burgess Commercial has been involved in the sale of two stone-fronted office buildings in the heart of Rotherham's professional district, known as 11 and 12 The Crofts, totalling approximately 3,000 sq ft. The adjacent property at 14 and 15 The Crofts went unsold at Pugh Auctions in February from a guide price of £250,000. The Rotherham-based agents have also agreed terms on Rotherham's original Post Office at 22 Main Street which totals almost 6,000 sq ft.
At the Moorgate end of town, Burgess has secured the letting of 2,600 sq ft of Grade-A office space at Stewart House on South Grove, to CTS, the learning provider that specialises in helping to get unemployed people back in to work, as it centralises and consolidates its operation in this Rotherham branch. Also at Moorgate, agents at Fernie Greaves have recently started marketing the site of Moorgate House for £600,000. The development site extends to just over an acre and was earmarked for residential accommodation. In 2009, Rotherham's Horbury Group cleared the site, which has planning consent for two blocks of apartments. Situated within a conservation area, the original Victorian façade of Moorgate House remains. Having been most recently used as offices for Unison, the North and West façades of the original villa were to be incorporated into the housing scheme. Final nail in the coffin of rotherhams night time economy. The old Nat West Bank has actually been on the market for months -it would make a great weatherspoons ! !